SRZ Holidays (A Unit Of SRZ Enterprises India Pvt. Ltd.) is a remarkable name in the tourism industry providing our clients with various travel related services such as Airline Ticketing, Cruise Services, Railway Ticketing, Car & Coach Rental, Hotel Booking Services, Passport & Visa Services and Travel Insurance Services. We have strong presence in the tourism industry and organize various tours taking you to different domestic as well as international locations. Our domestic tours takes you to Kerala, Goa, Shimla, Manali, J&K, Rajasthan and various parts of India. In addition, our international tours includes location such as Dubai, Singapore, Malaysia, Bangkok, Sri Lanka, Maldives, Mauritius, Switzerland and various parts of the world. Apart from taking you on a fun ride, we also support you in creating spectacular events for your organization. We do have private farms in an out of hyderabad for your corporate events,family parties and for day outing purpose. 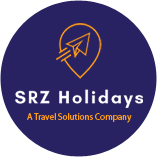 Based in Hyderabad (Telangana), SRZ Holidays (A Unit Of SRZ Enterprises India Pvt. Ltd.) was founded in the year 2014 with a vision to make a great contribution in the travel industry. We emphasize mainly on client satisfaction and make sure that all your needs are satisfied. We work under the expert guidance of Mohammed Abdur Rahman. His insightful knowledge has helped us to achieve a great name in the market.